With the warm weather here, I’ve been craving more fruit. The strawberries here look so amazing this time of the year and they are so delicious. I decided to make something that is simple, delicious and healthy for a treat. 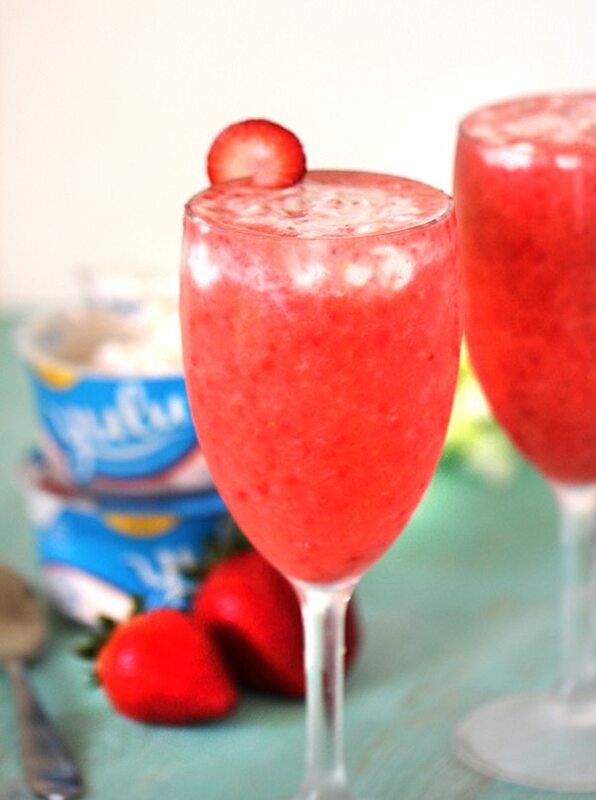 Combining a very simple real strawberry slushy, I swirled in some delicious Yulu Strawberry yogurt for a unique and refreshing combo. Just the perfect cool beverage for the hot summer days ahead. The tangy but sweet strawberry slushy tastes so good mixed up with swirls of this decadent creamy yogurt. This is a sponsored conversation written by me on behalf of Yulu. The opinions and text are all mine. Let me tell you a few things about Yulu yogurt. Have you seen it in stores yet? You might be wondering what’s unique about it! Well, I’ll venture to say that it’s an all new yogurt experience made Aussie style. What this means to me is that it’s extra creamy and made with honest ingredients like real fruit. Unlike Greek yogurt, there is no sourish or strong taste involved. It’s all smooth, sweet and creamy. 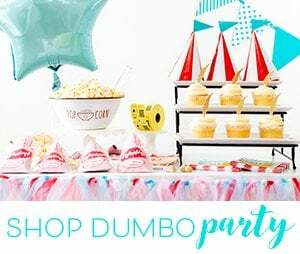 Some flavors you’ll find are Vanilla Bean, Honey, Strawberry, Blueberry and Raspberry. As an added bonus, each serving has 9 grams of protein! 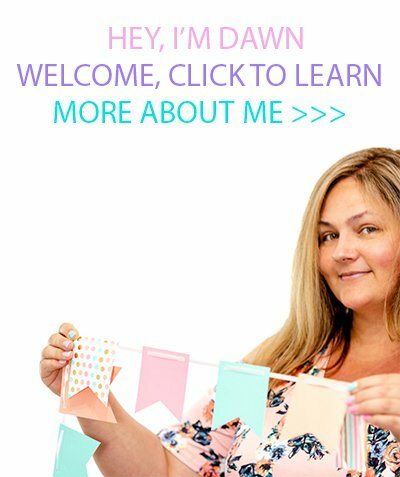 It’s great for breakfast, a quick snack for on the go or perfect to make something delicious like the Slushy I’m sharing today. Mmm. My son is extremely active, so I like to be able to provide thirst quenching beverages like this that I can feel good about. Jam packed with fresh fruit and yogurt, it’s a total win for me. For the slushy base, I used about a cup of sliced strawberries (approx 7-8 medium strawberries) with ice and water until blended. You can opt to add a touch of extra sweetness, I recommend honey, sugar or your favorite sweetener to taste. To make this extra special and satisfying, I topped off my slushy with a half container of Strawberry Yulu yogurt. To do this, I spooned the yogurt on top of the slushy mixture and swirled in with a butter knife. 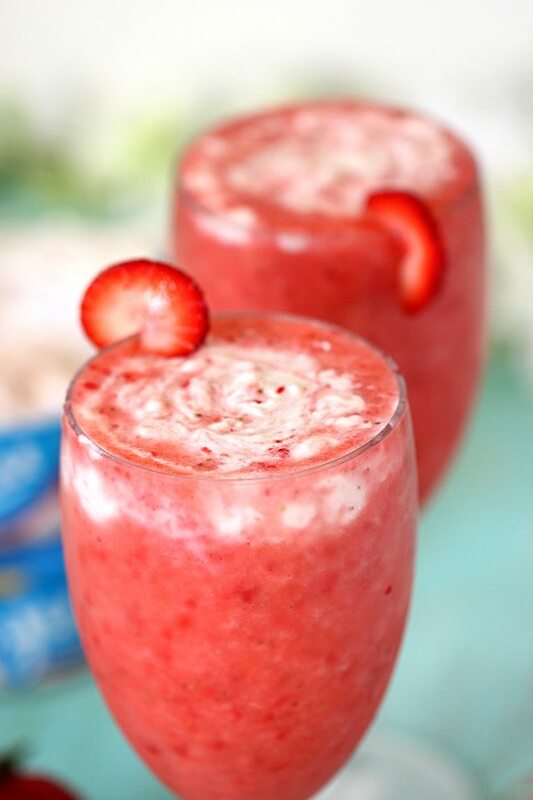 I love the contrast of the tart strawberry slushy mixed in with surprise sips of the creamy dreamy yogurt. It’s a snack that I can feel good about serving. 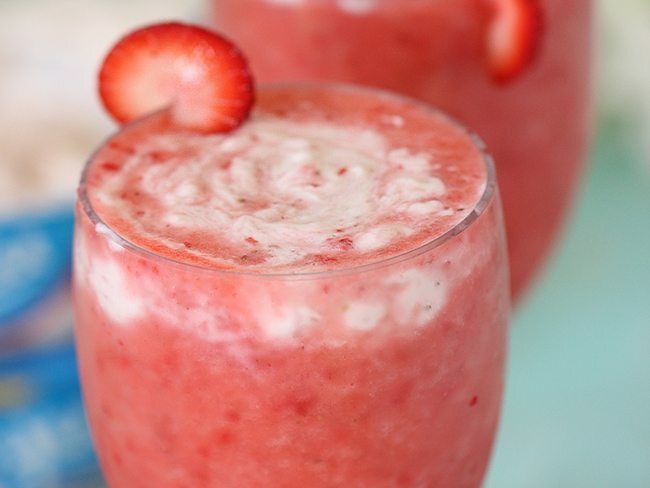 Use a high powered blender and mix strawberries, water and ice until ice is fully crushed. (Optional - add sweetener of choice to taste) Pour mixture into a cup leaving plenty of room at the top for your yogurt swirl. Spoon yogurt on top and use the thin end of a spoon or a butter knife to swirl it into the mixture. That's it! Enjoy your simple and refreshing slushy! Serves one. 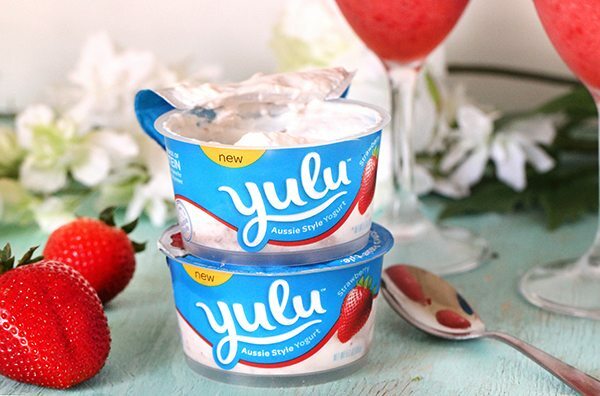 Make sure to pick up some Yulu Yogurt to try out this Aussie-style yogurt for yoursefl! Which flavor do you want to try first? This is a sponsored conversation written by me on behalf of Yulu. The opinions and text are all mine.